If you’re a friend of mine on facebook then you already know that last night I posted about my feet and legs hurting from so much walking while I was in NYC. I thought I could maneuver rockin 6-inch heels on a daily basis but I was sadly mistaken. While in NYC I attended the blogger’s conference for Lane Bryant. They have a new body care line out called “Cacique Body”. I reviewed an item from it already a few weeks ago. But when I returned home from the conference, I had a pleasant surprise waiting for me on my doorstep. Lane Bryant had sent me the full line of products from the body care collection. They must have been reading my mind, (or knew that I was in pain, lol). It couldn’t have come at a better time. My feet and legs were so swollen last night that I couldn’t even touch them. So I had to wait until this morning to try the product out. 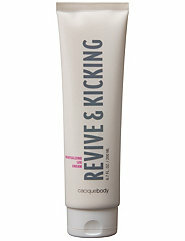 I used the “Revive & Kicking Revitalizing Leg Cream” on my legs and the “Keep It Smooth Anti-Chafing Cream to Powder” on my inner thighs. The leg cream works instant wonders. The tea tree oil invigorates and Vitamins A, C & E antioxidants moisturize and protect your skin. My legs felt refreshed the moment that I applied the cream. Since I was in spanx and girdles all weekend my inner thighs were screaming. (Just being real here, lol). So I used the chafing cream on them. Not bad I might add. I also needed that remedy as well. Natural corn starch absorbs moisture and helps prevent irritation and combats friction. So who needs a Dr. Feelgood when Lane Bryant is just the prescription to order!